Trisha Dennis National Training Center Commander Brig. 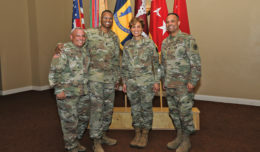 Gen. Jeff Broadwater (center), and NTC Command Sgt. Maj. Matthew Lowe (left), joined with members of Fort Irwin’s Toa O Samoa dance group after their performance at the Asian American and Pacific Islander heritage celebration May 23. FORT IRWIN, Calif. — The Sandy Basin Community Center came alive with the music and dance of the Pacific Islands during Fort Irwin’s Asian American and Pacific Islander heritage celebration May 23. 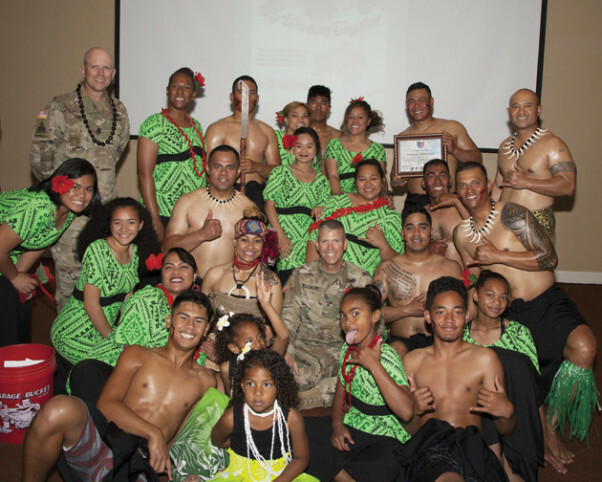 The dances were choreographed and performed by members of Toa O Samoa, a homegrown dance group comprised of active duty service members, retirees, DOD civilians and dependents here at the National Training Center. The group formed last year, but Chief Warrant Officer 3 Sorepa Thomas, of the 11th Armored Cavalry Regiment, said dancing is something they’ve been doing all of their lives. “We always look forward to the month of May so we can practice the dance and showcase what we were taught back home growing up,” she added. The nearly 59,000 Asian American and Pacific Islander Soldiers serving in the Army today encompass diverse backgrounds, coming from across the Asian continent, Melanesia, Micronesia and Polynesia. Like three quarters of the Toa O Samoa group, Thomas was born and raised in the Samoan Islands. Joining the Army wasn’t her original goal, but she was convinced after seeing her older sister serve. Now, her sister is retiring from the Army, and Thomas said she also hopes to continue serving until she reaches the 30-year mark. 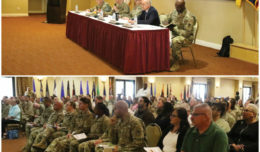 Regardless of where in the world their Army careers take them, she said the Pacific Islander community always finds a way to come together – including here at Fort Irwin. In addition to the performances by Toa O Samoa, the event highlighted the career of Vincent Okamoto, a judge of the Los Angeles Superior Court and a decorated Army veteran who served in the Vietnam War. Okamoto was born to a Japanese-American family during World War II. At the time, his family was interned at the Poston War Relocation Center in Arizona, where they lived in uninsulated barracks under armed guard. 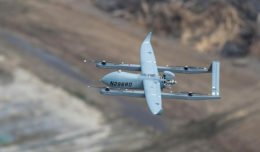 “Instead of feeling angry and betrayed, Mr. Okamoto completely went the other direction, signing up to serve his country and earning his commission in the United States Army,” said Lt. Col. Eric Vanek, commander of the 2916th Aviation Battalion, which hosted the event. Okamoto was unable to attend the celebration this year due to unforeseen circumstances, but he is expected to appear as the guest speaker at next year’s Asian American and Pacific Islander heritage event.